This website is privately hosted and free of charge. My name is Peter Hohl. The idea to start www.bridge-la-palma.de was born during an extended winter vacation on this island during which we were looking for other bridge players to team up with. It turned out to be a rather rewarding experience during which we were able to attain new friends. As such we decided to create this “social meeting platform” to find mutually minded people. If you are interested to join us, simply write me an email to peter.hohl@t-online.de. In return, I will send you a username and a password for our site called "Spielpartner (Players on La Palma)”. This is necessary to keep your contact information private and secure. Afterwards you can login with the username and password to see who is present and ready to play in your area. Furthermore, you’ll be able to directly contact each other (based on the contact information you provided) in order to meet up and play without further ado. At the same time, others will be able to see your status too and might ask you to join them for a round of bridge. Rest assured that this status information as well as your contact details is strictly confidential and that this part of the website can be only reached with your username and password. Upon request, I shall immediately remove you from the list (no questions asked). For starters we would like to keep it simple. We shall see if this little project of ours turns out to be a formal bridge club with a registration to a bridge club association in the future. We just came to realize that most bridge players are most amiable and pleasant when they share our interest in the picturesque sites of La Palma! In case you don’t wish to take along a bidding-box, feel free to use our improvised solution which is a PDF document (for light package). As such you should be able to track the biddings easily. Otherwise, you might also be interested to join us. Or come to our room below Avenida Constitucion on Wednesdays at 4 pm (see map below). From the beginning of November to the middle of April you will find there all the bridge players who are in La Palma – as well as bidding boxes, boards, cards and pamphlets. If you are a couple, you can come whenever you wish. If you are alone, please register at peter.hohl@t-online.de so that we can try to find a partner for you. Most recently we also started to advertise our “minority interest recruitment” via Twitter (@BridgeLaPalma). Any follower is welcome to tag along. Yet, an ordinary text-link will also do. A short note about your link would be equally appreciated (allowing me to link back to your website). We play in Tazacorte pueblo (village), not at the beach. 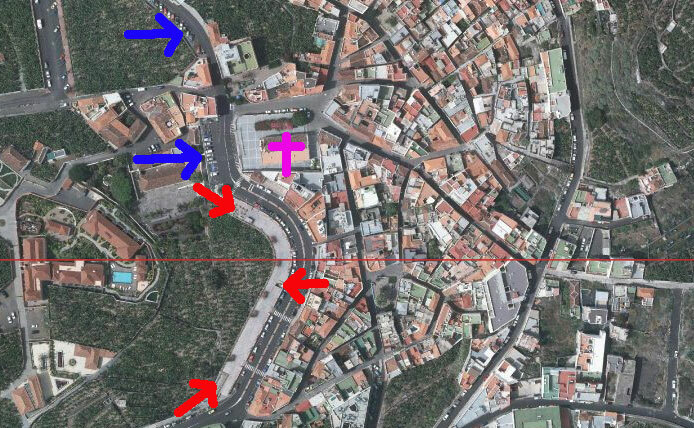 Red arrows on the map indicate entrances to the rooms below Avenida Constitucion. The cross marks the church, for orientation.